As a customer of this third generation, family-owned and operated, broadline food service distributor based on Hawaii Island, Suisan is committed to your success. We understand the changing needs of Island business and have expanded our product mix over time to also include nonfood supplies. By actively pursuing best practices, continually evolving, and investing in the future, we will always be able to provide you with quality service. Frozen meats, fruits, vegetables, bakery, dairy and processed entrees, beverages, chill & frozen retail, chill meats, beef, pork, chicken, seafood, eggs. Dry & canned grocery, spices, condiments, bakery ingredients, beverages. For best food safety practices from receiving, prepping and handling, cooking, cleaning, servicing, storing, ware washing and more. Be sure to check out our section on food safety for all your janitorial, paper goods, sanitizing and safety needs. 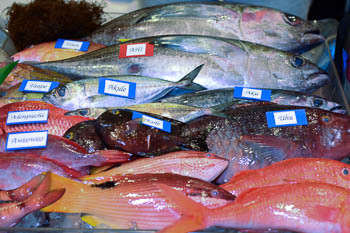 Fresh fish and seafood from the Suisan Fish Market all week, where local fisherman supply a variety of fine, fresh fish from our own Hawaiian waters. With professionalism and enthusiasm we provide restaurants, schools, delis, healthcare facilities, government facilities, resorts and institutions with quality products and exceptional service.